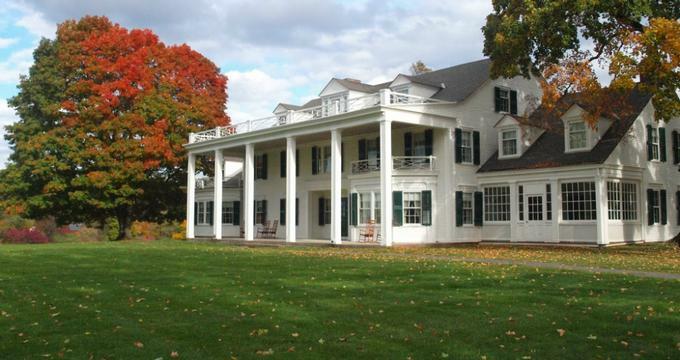 With beautiful gardens, a significant art collection, and a century of history, the Hill-Stead Museum in Connecticut is sure to delight and inspire visitors of all ages. The institution now known as the Hill-Stead Museum was once the home of the Pope-Riddle family. Alfred and Ada Pope first moved to the estate in 1901 after their only daughter, Theodate, urged them to pursue a life of purpose in the countryside. Alfred Pope had made his fortune in the iron industry and was also an avid art enthusiast. A turning point for the family occurred when Alfred arranged for his wife and daughter to accompany him on a tour of Europe. Once there, the family saw the burgeoning turn of the century artistic landscape of Paris and fell in love with impressionism. Alfred began to collect art by well-known artists such as Manet and Monet, displaying the pieces at Hill-Stead. Her father’s passion for the arts inspired Theodate to pursue a career as an architect, which was an uncommon career for woman of her time. She also operated a successful farming enterprise and was highly involved with social causes, which culminated in her fostering several orphaned children. In her later years, Theodate married John Wallace Riddle, who was a diplomat and scholar in his own right. The pair travelled the world together as John was constantly called to new and exotic locales such as Turkey, Egypt, and Russia. Theodate passed away in 1946, mandating that Hill-Stead be turned into a museum and stipulating that none of the existing items in the home be moved or altered in any way. Alfred Pope’s collection of French impressionist art was acquired between the years of 1888 and 1907. Ahead of his time, Pope was one of the first Americans to collect impressionist art. His rigorous standards and finely honed personal aesthetic was quite a departure from the prevailing opinions of his time. At the turn of the century, many of his contemporaries and much of the academic world still considered impressionists to be radical and even iconoclastic. Today visitors can reap the benefits of Pope’s discerning eye by viewing pieces by masters such as Monet, Manet, Degas, Mary Cassatt, and many others. While Alfred Pope was no doubt taken by the works of European impressionists, he also appreciated many of their American counterparts. In particular, works by American artist James McNeil Whistler feature prominently in Pope’s collection. The use of light, suggestive brushstrokes, and an innovative pallet showcase the artist’s gradual departure from realism. In contrast to this, visitors can see portraits of both Ada and Alfred by American artists, who utilized a more photo realistic approach in their depictions. Impressionism was by no means the only style of art that was of interest to Alfred Pope. His collections of symbolist artists, such as Eugene Carriere, demonstrate his interest in different visual languages. These paintings are often recognized for their soft atmospheric approach, which was meant to capture the “soul” of their subjects. The paintings on display allow visitors to compare and contrast these different styles and discuss the commonalities within them. While many elite Victorians had a fascination with sculpture as ornamentation in their homes, Alfred Pope’s approach to collecting 3D pieces speak to his singular tastes and interests. His European travels gave him an appreciation of ancient Roman busts. Visitors can see one such sculpture of Marcus Aurelius, which was originally created in 180 AD. In addition, Pope’s fascination with animal forms can be seen in his eight bronze sculptures by Antoine-Louis Barye. With a background as a goldsmith, Barye was considered as one of the leading sculptors of animal forms of his time. The purple, pink, and silver hues of the sunken garden complement the art work with the museum by echoing the impressionist color pallet. Spread across an acre of land, the sunken garden offers scenic walks and a picturesque backdrop for photographs. Visitors can see a summer house, a stone sundial, brick walkways, and over 90 varieties of perennials spread across more than 36 beds. The garden is also home to many species of butterflies and birds, which add to its romantic appeal. Those planning to tour the museum in the summer may wish to arrive in time for the Sunken Garden Poetry Festival, where they can take in live music and poetry recitations in the garden’s tranquil center.